On March 20, 2017, the account "Chechen News" on the YouTube posted a video entitled "Meeting of Military Jamaat of Ichkeria". According to the captions to the video, it shows former fighters of the grouping "Jaish al-Muhajireen wal-Ansar" (hyperlink to the Russian language material - note of the 'Caucasian Knot'), who had fought in Syria. In the video, armed people, whose faces are masked, discuss how they will "gather Muhajids." "Christians and munafiqs will learn, with Allah's help, that we are alive, we are not dead," a masked man says. 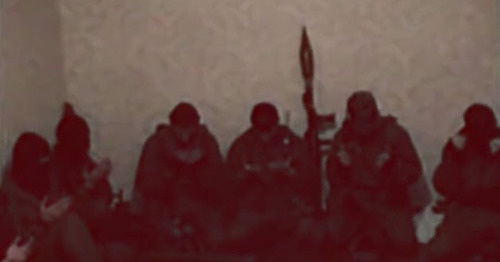 On March 24, in one of the first comments to the video posted on the YouTube, a debater under the nickname "We Have Arrived In Grozny" wrote: "These are the fighters who have attacked a military base today!" Presumably, he meant the attack on a "Natsgvardia" (National Guard of Russia) checkpoint in the Naur District of Chechnya. The "Caucasian Knot" hereby suggests recalling the development of events around the previous similar video message posted on the Internet on December 28, 2016, 10 days after an armed clash of militants with the police in Grozny. Then, the video showing young men swearing allegiance to the "Islamic State" (IS), a terrorist organization, banned in Russia by the court, was followed by several other videos showing the young people rejecting their oaths. The video, which appeared on the Internet on December 28 (at the moment, the video is not accessible under the previous address), showed 11 militants swearing allegiance to the "Islamic State" (IS), banned in Russia. The video showed 11 young people, some of them armed with knives, against the background of the khaki curtain and the black flag of the IS. The figures of three of them were retouched. In the video, after swearing allegiance to Abu Bakr al-Baghdadi, the leader of the IS militants, the young people called on their supporters to commit attacks in Chechnya and other Russian cities. In particular, they mentioned Volgograd. Meanwhile, threats were also addressed to the "people of Russia." The militants claimed the number of their supporters was not 40, and not 50. The record can be considered as a pre-mortal video of the participants in the December attack. Meanwhile, in the video itself, none of them say anything about the planned attack. The photo of the policemen killed in Grozny and the bodies of the militants themselves were inserted only to the end of the video. On December 19, the SITE Intelligence Group (an NGO registered in the US and tracking the activities of terrorist groupings on the Internet) published the statement of the "Islamic State"*, claiming responsibility for the attacks on policemen in Grozny on December 17-18. Besides, Chechen leader Ramzan Kadyrov (hyperlink to the Russian language material - note of the 'Caucasian Knot') stated that the militants detained during the armed clash were members of the IS*. A month after the record with the men swearing allegiance to the IS*, two other videos appeared on the Internet; this time, they showed their repentances for the swearing allegiance voiced earlier. The repentance videos were posted on the YouTube on January 18 and 31, 2018. In them, people mention that they had sworn allegiance to the IS*, and say they had been misled. The date and details of the records are unknown. The video records of retraction from the IS* are monologues of four persons, presented in various sequences, pronounced in the Russian and Chechen languages. The young men speak against the background of a black flag with a skull and two crossbones, which echoes the video with swearing allegiance made against the black flag of the "Islamic State"*; they threaten to take revenge of Abu Bakr al-Baghdadi. One of the men in the video calls himself "a person who had sworn allegiance to Abu Bakr al-Baghdadi and who, in his delusion, treated him as a Caliph." "He deceived me and many other Muslims," says the young man who did not introduce himself. He brandishes a big knife and threatens revenge against the leader of the IS* "for the delusions." Then, a monologue in the Chechen language follows. A man introduced himself as Adam Ilyasov. He called himself a participant of the video showing people swearing allegiance to the IS* and said that in the December video his face was retouched. Meanwhile, he stood next to Ismail Bergoev, who later, on December 18, 2016, was wounded and detained by law enforcers (hyperlink to the Russian language material - note of the 'Caucasian Knot'). The young man pronounces a curse upon Abu Bakr al-Baghdadi, who "is hiding somewhere, and you, who are on the front line, will be killed" (translation of the "Caucasian Knot"). The young man who introduced himself as Adam Ilyasov does not say that he took part in the December attack in Grozny, but he mentions that the video with swearing allegiance was recorded "before we committed an act of evil." Another participant of the repentance video does not introduce himself. He says in Russian that he had sworn allegiance to the man who "killed Muslims" and threatens revenge against Abu Bakr al-Baghdadi. "I call on the people of my age not to be deceived and not to deceive themselves," the young man has stated. The fourth hero of the video speaks the Chechen language and does not voice his name. He pronounces a curse upon the leader of the IS*. "We committed a low act against a free Muslim who came out of a mosque after committing (a religious rite), and let Allah accept his gazavat," says the young man. He is probably referring to the murder of a policeman committed in the village of Tashkala in the Staropromyslovsky District on December 18, 2016. 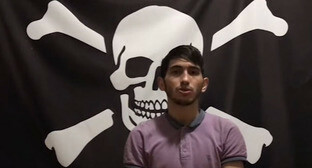 The appearance of the above statement in the video does not comply with the official information released by the law enforcement bodies of Chechnya, according to which Ibraghim Mazhaev, Khamatkhan Mintaev, Istamul Mamaev, and Akhmad Akrashev, suspected of murdering the policeman, were killed. The appeals showing repentances were posted on the YouTube account named SprinG Proff, which also posted videos that complimented the Chechen authorities and presented in negative the critics of the Chechen regime, including refugees to Europe and members of the Russian opposition. At the moment, the SprinG Proff account has been deleted. A story with retraction of the IS* oath can be compared with a number of other episodes when critics and opponents of the Chechen authorities were forced under pressure to retract their statements and bring their apologies, which were recorded on video. A number of such cases were reported by the "Human Rights Watch" (HRW) in its report "Like Walking a Minefield". How many attacks has IS* committed in Chechnya? Such a surge in the IS* activities in Chechnya looks very sharp given the fact that the IS* voiced threats to start a war in the Caucasus back in September 2014; but within two years thereafter, no major attacks were reported to be committed by members of the grouping in Chechnya. The "Caucasian Knot" monitors the situation in Chechnya and continues running the chronicle of special operations, terror acts and kidnappings taking place in the republic. The "Caucasian Knot" publishes materials on the influence of the war in the Middle East on the situation in the regions of the Caucasus on its special thematic page "Caucasus held at gunpoint by Caliphate". In the section "Guide" you can also find the materials "Caucasians in the ranks of IS*" and "Natives of Caucasus in 'Al-Nusra Front'" (a terrorist organization banned in Russia by the court; hyperlink to the Russian language material - note of the 'Caucasian Knot'). KChR's policemen force a militant to swear allegiance to the "MIA's Jamaat" // Life.ru, October 26, 2016..
A special operation carried out in the Shali District of Chechnya, three militants liquidated // The head and the government of the Chechen Republic, January 30, 2017..
A Russian prisoner of Guantanamo included into the list of terrorists released in Turkey // Kommersant, July 15, 2016.